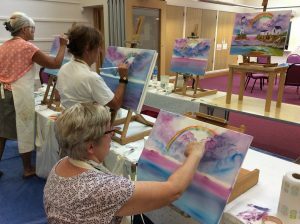 What a wonderful week it’s been….. We had a gentleman visit us from the mainland for a Painting Holiday Mini-Break which involved individual tuition, a group workshop (photo above), plenty of meals with friends and days out round the Island. Not only that, the weather stayed sunny so it was perfect. Following that, time was spent organising the Art Student Exhibition coming up on 1st October at The Salvation Army Hall in Newport. It was set up with the idea that it would be lovely for the art students to have something to aim for throughout the year. Not only that, when exhibiting for the first time it can feel quite daunting so doing it as a group makes it a more relaxed and fun affair. We now have an exhibition opening time of 10am on the Saturday with the local newspaper on hand to take photographs.